The succinate dehydrogenase complex showing several cofactors, including flavin, iron-sulfur centers, and heme. A cofactor is a non-protein chemical compound that is required for the protein's biological activity. These proteins are commonly enzymes, and cofactors can be considered "helper molecules" that assist in biochemical transformations. Bugg, Tim (1997). An introduction to enzyme and coenzyme chemistry. Oxford: Blackwell Science. ^ Nelson, David (2008). . New York: W.H. Freeman and Company. p. 184. ^ "coenzymes and cofactors". Retrieved 2007-11-17. ^ "Enzyme Cofactors". Retrieved 2007-11-17. ^ a b c d e f Sauke, David J.; Metzler, David E.; Metzler, Carol M. (2001). Biochemistry: the chemical reactions of living cells (2nd ed.). San Diego: Harcourt/Academic Press. ^ Jordan, Frank; Patel, Mulchand S. (2004). Thiamine: catalytic mechanisms in normal and disease states. New York, N.Y: Marcel Dekker. p. 588. ^ a b Denessiouk KA, Rantanen VV, Johnson MS (2001). "Adenine recognition: a motif present in ATP-, CoA-, NAD-, NADP-, and FAD-dependent proteins". Proteins 44 (3): 282–91. ^ Bryce CFA (March 1979). "SAM – semantics and misunderstandings". Trends Biochem. Sci. 4 (3): N62. ^ Aggett PJ (1985). "Physiology and metabolism of essential trace elements: an outline". Clin Endocrinol Metab 14 (3): 513–43. ^ Stearns DM (2000). "Is chromium a trace essential metal?". BioFactors 11 (3): 149–62. ^ Vincent JB (1 April 2000). "The biochemistry of chromium". J. Nutr. 130 (4): 715–8. ^ Cavalieri RR (1997). "Iodine metabolism and thyroid physiology: current concepts". Thyroid 7 (2): 177–81. ^ Clapham DE (2007). "Calcium signaling". Cell 131 (6): 1047–58. ^ Niki I, Yokokura H, Sudo T, Kato M, Hidaka H (1996). "Ca2+ signaling and intracellular Ca2+ binding proteins". J. Biochem. 120 (4): 685–98. ^ Eady RR (1988). "The vanadium-containing nitrogenase of Azotobacter". BioFactors 1 (2): 111–6. ^ Chan MK, Mukund S, Kletzin A, Adams MW, Rees DC (1995). "Structure of a hyperthermophilic tungstopterin enzyme, aldehyde ferredoxin oxidoreductase". Science 267 (5203): 1463–9. ^ Lane TW, Morel FM (2000). "A biological function for cadmium in marine diatoms". Proc. Natl. Acad. Sci. U.S.A. 97 (9): 4627–31. ^ Lane TW, Saito MA, George GN, Pickering IJ, Prince RC, Morel FM (2005). "Biochemistry: a cadmium enzyme from a marine diatom". Nature 435 (7038): 42. ^ Meyer J (February 2008). "Iron-sulfur protein folds, iron-sulfur chemistry, and evolution". J. Biol. Inorg. Chem. 13 (2): 157–70. ^ Palmer, Trevor (1981). Understanding enzymes. New York: Horwood. ^ Cox, Michael; Lehninger, Albert L; Nelson, David R. (2000). Lehninger principles of biochemistry (3rd ed.). New York: Worth Publishers. ^ Farrell, Shawn O.; Campbell, Mary K. (2009). Biochemistry (6th ed.). Pacific Grove: Brooks Cole. ^ Bolander FF (2006). "Vitamins: not just for enzymes". Curr Opin Investig Drugs 7 (10): 912–5. ^ Rouvière PE, Wolfe RS (15 June 1988). "Novel biochemistry of methanogenesis". J. Biol. Chem. 263 (17): 7913–6. ^ Frank RA, Leeper FJ, Luisi BF (2007). "Structure, mechanism and catalytic duality of thiamine-dependent enzymes". Cell. Mol. Life Sci. 64 (7–8): 892–905. ^ a b Pollak N, Dölle C, Ziegler M (2007). "The power to reduce: pyridine nucleotides—small molecules with a multitude of functions". Biochem. J. 402 (2): 205–18. ^ Eliot AC, Kirsch JF (2004). "Pyridoxal phosphate enzymes: mechanistic, structural, and evolutionary considerations". Annu. Rev. Biochem. 73: 383–415. ^ Banerjee R, Ragsdale SW (2003). "The many faces of vitamin B12: catalysis by cobalamin-dependent enzymes". Annu. Rev. Biochem. 72: 209–47. ^ Jitrapakdee S, Wallace JC (2003). "The biotin enzyme family: conserved structural motifs and domain rearrangements". Curr. Protein Pept. Sci. 4 (3): 217–29. ^ Leonardi R, Zhang YM, Rock CO, Jackowski S (2005). "Coenzyme A: back in action". Prog. Lipid Res. 44 (2–3): 125–53. ^ Donnelly JG (2001). "Folic acid". Crit Rev Clin Lab Sci 38 (3): 183–223. ^ Søballe B, Poole RK (1999). "Microbial ubiquinones: multiple roles in respiration, gene regulation and oxidative stress management". Microbiology (Reading, Engl.) 145 (8): 1817–30. ^ Linster CL, Van Schaftingen E (2007). "Vitamin C. Biosynthesis, recycling and degradation in mammals". FEBS J. 274 (1): 1–22. ^ a b Joosten V, van Berkel WJ (2007). "Flavoenzymes". Curr Opin Chem Biol 11 (2): 195–202. ^ Mack M, Grill S (2006). "Riboflavin analogs and inhibitors of riboflavin biosynthesis". Appl. Microbiol. Biotechnol. 71 (3): 265–75. ^ Bugg, Tim (1997). An introduction to enzyme and coenzyme chemistry. Oxford: Blackwell Science. p. 95. ^ Chiang P, Gordon R, Tal J, Zeng G, Doctor B, Pardhasaradhi K, McCann P (1996). "S-Adenosylmethionine and methylation". FASEB J 10 (4): 471–80. ^ Noll KM, Rinehart KL, Tanner RS, Wolfe RS (1986). "Structure of component B (7-mercaptoheptanoylthreonine phosphate) of the methylcoenzyme M methylreductase system of Methanobacterium thermoautotrophicum". Proc. Natl. Acad. Sci. U.S.A. 83 (12): 4238–42. ^ Taylor CD, Wolfe RS (10 August 1974). "Structure and methylation of coenzyme M(HSCH2CH2SO3)". J. Biol. Chem. 249 (15): 4879–85. ^ Balch WE, Wolfe RS (1979). "Specificity and biological distribution of coenzyme M (2-mercaptoethanesulfonic acid)". J. Bacteriol. 137 (1): 256–63. ^ Crane FL (1 December 2001). "Biochemical functions of coenzyme Q10". Journal of the American College of Nutrition 20 (6): 591–8. ^ Buchanan; Gruissem, Jones (2000). Biochemistry & molecular biology of plants (1st ed.). American society of plant physiology. ^ Grill D, Tausz T, De Kok LJ (2001). Significance of glutathione in plant adaptation to the environment. Springer. ^ Meister A, Anderson ME (1983). "Glutathione". Annu. Rev. Biochem. 52: 711–60. ^ Wijayanti N, Katz N, Immenschuh S (2004). "Biology of heme in health and disease". Curr. Med. Chem. 11 (8): 981–6. ^ Vorholt JA, Thauer RK (1997). "The active species of 'CO2' utilized by formylmethanofuran dehydrogenase from methanogenic Archaea". Eur. J. Biochem. 248 (3): 919–24. ^ Mendel RR, Hänsch R (2002). "Molybdoenzymes and molybdenum cofactor in plants". J. Exp. Bot. 53 (375): 1689–98. ^ Mendel RR, Bittner F (2006). "Cell biology of molybdenum". Biochim. Biophys. Acta 1763 (7): 621–35. ^ Ginsburg V (1978). "Comparative biochemistry of nucleotide-linked sugars". Prog. Clin. Biol. Res. 23: 595–600. ^ Negishi M, Pedersen LG, Petrotchenko E, et al. (2001). "Structure and function of sulfotransferases". Arch. Biochem. Biophys. 390 (2): 149–57. ^ Salisbury SA, Forrest HS, Cruse WB, Kennard O (August 1979). 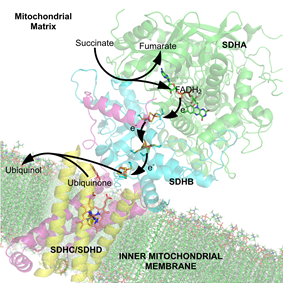 "A novel coenzyme from bacterial primary alcohol dehydrogenases". Nature 280 (5725): 843–4. ^ Thony B, Auerbach G, Blau N (2000). "Tetrahydrobiopterin biosynthesis, regeneration and functions". Biochem J 347 (1): 1–16. ^ DiMarco AA, Bobik TA, Wolfe RS (1990). "Unusual coenzymes of methanogenesis". Annu. Rev. Biochem. 59: 355–94. ^ Mitchell P (1979). "The Ninth Sir Hans Krebs Lecture. Compartmentation and communication in living systems. Ligand conduction: a general catalytic principle in chemical, osmotic and chemiosmotic reaction systems". Eur J Biochem 95 (1): 1–20. ^ Wimmer M, Rose I (1978). "Mechanisms of enzyme-catalyzed group transfer reactions". Annu Rev Biochem 47: 1031–78. ^ Di Carlo SE, Collins HL (2001). "Estimating ATP resynthesis during a marathon run: a method to introduce metabolism". Advan. Physiol. Edu. 25 (2): 70–1. ^ Chen X, Li N, Ellington AD (2007). "Ribozyme catalysis of metabolism in the RNA world". Chem. Biodivers. 4 (4): 633–55. ^ Koch A (1998). "How did bacteria come to be?". Adv Microb Physiol 40: 353–99. ^ Ouzounis C, Kyrpides N (1996). "The emergence of major cellular processes in evolution". FEBS Lett 390 (2): 119–23. ^ White HB (1976). "Coenzymes as fossils of an earlier metabolic state". J. Mol. Evol. 7 (2): 101–4. ^ Saran D, Frank J, Burke DH (2003). "The tyranny of adenosine recognition among RNA aptamers to coenzyme A". BMC Evol. Biol. 3: 26. ^ Jadhav VR, Yarus M (2002). "Coenzymes as coribozymes". Biochimie 84 (9): 877–88. ^ Khoury, GA; Fazelinia, H; Chin, JW; Pantazes, RJ; Cirino, PC; Maranas, CD (October 2009). xylose reductase for altered cofactor specificity"Candida boidinii"Computational design of . Protein Science 18 (10): 2125–38. ^ Harden A, Young WJ (24 October 1906). "The Alcoholic Ferment of Yeast-Juice". Proceedings of the Royal Society B: Biological Sciences 78 (526): 369–75. ^ "Fermentation of sugars and fermentative enzymes: Nobel Lecture, May 23, 1930". Nobel Foundation. Retrieved 2007-09-30. ^ Lohmann K (August 1929). "Über die Pyrophosphatfraktion im Muskel". Naturwissenschaften 17 (31): 624–5. ^ Lipmann F (1 September 1945). "Acetylation of sulfanilamide by liver homogenates and extracts". J. Biol. Chem. 160 (1): 173–90. ^ Warburg O, Christian W. (1936). "Pyridin, the hydrogen-transferring component of the fermentation enzymes (pyridine nucleotide)". Biochemische Zeitschrift 287: 291. ^ Kalckar HM (1974). "Origins of the concept oxidative phosphorylation". Mol. Cell. Biochem. 5 (1–2): 55–63. ^ Lipmann F, (1941). "Metabolic generation and utilization of phosphate bond energy". Adv Enzymol 1: 99–162. ^ Friedkin M, Lehninger AL. (1949). "Esterification of inorganic phosphate coupled to electron transport between dihydrodiphosphopyridine nucleotide and oxygen". J. Biol. Chem. 178 (2): 611–23. ^ Davidson VL, Wilmot CM (2013). "Posttranslational biosynthesis of the protein-derived cofactor tryptophan tryptophylquinone.". Annu. Rev. Biochem. 82: 531–50. ^ Huang SX, Lohman JR, Huang T, Shen B (May 2013). "A new member of the 4-methylideneimidazole-5-one-containing aminomutase family from the enediyne kedarcidin biosynthetic pathway.". Proc. Natl. Acad. Sci. U.S.A. 110 (20): 8069–74. ^ McKenna NJ, O'Malley BW (October 2008). "Editorial: Coactivators and Corepressors: What’s in a Name?.". Mol. Endocrinol. 22 (10): 2213–4. The functions of these molecules were at first mysterious, but, in 1936, Otto Heinrich Warburg identified the function of NAD+ in hydride transfer. This discovery was followed in the early 1940s by the work of Herman Kalckar, who established the link between the oxidation of sugars and the generation of ATP. This confirmed the central role of ATP in energy transfer that had been proposed by Fritz Albert Lipmann in 1941. Later, in 1949, Morris Friedkin and Albert L. Lehninger proved that NAD+ linked metabolic pathways such as the citric acid cycle and the synthesis of ATP. The first organic cofactor to be discovered was NAD+, which was identified by Arthur Harden and William Youndin 1906. They noticed that adding boiled and filtered yeast extract greatly accelerated alcoholic fermentation in unboiled yeast extracts. They called the unidentified factor responsible for this effect a coferment. Through a long and difficult purification from yeast extracts, this heat-stable factor was identified as a nucleotide sugar phosphate by Hans von Euler-Chelpin. Other cofactors were identified throughout the early 20th century, with ATP being isolated in 1929 by Karl Lohmann, and coenzyme A being discovered in 1945 by Fritz Albert Lipmann. A computational method, IPRO, recently predicted mutations that experimentally switched the cofactor specificity of Candida boidinii xylose reductase from NADPH to NADH. Details on how to download the software implemented in Python and experimental testing of predictions are outlined in the following paper. Organic cofactors may have been present even earlier in the history of life on Earth. It is interesting to note that the nucleotide adenosine is present in cofactors that catalyse many basic metabolic reactions such as methyl, acyl, and phosphoryl group transfer, as well as redox reactions. This ubiquitous chemical scaffold has, therefore, been proposed to be a remnant of the RNA world, with early ribozymes evolving to bind a restricted set of nucleotides and related compounds. Adenosine-based cofactors are thought to have acted as interchangeable adaptors that allowed enzymes and ribozymes to bind new cofactors through small modifications in existing adenosine-binding domains, which had originally evolved to bind a different cofactor. This process of adapting a pre-evolved structure for a novel use is referred to as exaptation. Organic cofactors, such as ATP and NADH, are present in all known forms of life and form a core part of metabolism. Such universal conservation indicates that these molecules evolved very early in the development of living things. At least some of the current set of cofactors may, therefore, have been present in the last universal ancestor, which lived about 4 billion years ago. The redox reactions of nicotinamide adenine dinucleotide. nucleotide, such as the electron carriers NAD and FAD, and coenzyme A, which carries acyl groups. Most of these cofactors are found in a huge variety of species, and some are universal to all forms of life. An exception to this wide distribution is a group of unique cofactors that evolved in methanogens, which are restricted to this group of archaea. Organic cofactors are small organic molecules (typically a molecular mass less than 1000 Da) that can be either loosely or tightly bound to the enzyme and directly participate in the reaction. In the latter case, when it is difficult to remove without denaturing the enzyme, it can be called a prosthetic group. It is important to emphasize that there is no sharp division between loosely and tightly bound cofactors. Indeed, many such as NAD+ can be tightly bound in some enzymes, while it is loosely bound in others. Another example is thiamine pyrophosphate (TPP), which is tightly bound in transketolase or pyruvate decarboxylase, while it is less tightly bound in pyruvate dehydrogenase. Other coenzymes, flavin adenine dinucleotide (FAD), biotin, and lipoamide, for instance, are covalently bound. Tightly bound cofactors are, in general, regenerated during the same reaction cycle, while loosely bound cofactors can be regenerated in a subsequent reaction catalyzed by a different enzyme. In the latter case, the cofactor can also be considered a substrate or cosubstrate. Iron-sulfur clusters are complexes of iron and sulfur atoms held within proteins by cysteinyl residues. They play both structural and functional roles, including electron transfer, redox sensing, and as structural modules. A simple [Fe2S2] cluster containing two iron atoms and two sulfur atoms, coordinated by four protein cysteine residues. In many cases, the cofactor includes both an inorganic and organic component. One diverse set of examples is the heme proteins, which consist of a porphyrin ring coordinated to iron. Other organisms require additional metals as enzyme cofactors, such as vanadium in the nitrogenase of the nitrogen-fixing bacteria of the genus Azotobacter, tungsten in the aldehyde ferredoxin oxidoreductase of the thermophilic archaean Pyrococcus furiosus, and even cadmium in the carbonic anhydrase from the marine diatom Thalassiosira weissflogii. nutrition, the list of essential trace elements reflects their role as cofactors. In humans this list commonly includes iron, magnesium, manganese, cobalt, copper, zinc, and molybdenum. Although chromium deficiency causes impaired glucose tolerance, no human enzyme that uses this metal as a cofactor has been identified. Iodine is also an essential trace element, but this element is used as part of the structure of thyroid hormones rather than as an enzyme cofactor. Calcium is another special case, in that it is required as a component of the human diet, and it is needed for the full activity of many enzymes, such as nitric oxide synthase, protein phosphatases, and adenylate kinase, but calcium activates these enzymes in allosteric regulation, often binding to these enzymes in a complex with calmodulin. Calcium is, therefore, a cell signaling molecule, and not usually considered a cofactor of the enzymes it regulates. A 1979 letter in Trends in Biochemical Sciences noted the confusion in the literature and the essentially arbitrary distinction made between prosthetic groups and coenzymes and proposed the following scheme. Here, cofactors were defined as an additional substance apart from protein and substrate that is required for enzyme activity and a prosthetic group as a substance that undergoes its whole catalytic cycle attached to a single enzyme molecule. However, the author could not arrive at a single all-encompassing definition of a "coenzyme" and proposed that this term be dropped from use in the literature. Organic cofactors are sometimes further divided into coenzymes and prosthetic groups. The term coenzyme refers specifically to enzymes and, as such, to the functional properties of a protein. On the other hand, "prosthetic group" emphasizes the nature of the binding of a cofactor to a protein (tight or covalent) and, thus, refers to a structural property. Different sources give slightly different definitions of coenzymes, cofactors, and prosthetic groups. Some consider tightly bound organic molecules as prosthetic groups and not as coenzymes, while others define all non-protein organic molecules needed for enzyme activity as coenzymes, and classify those that are tightly bound as coenzyme prosthetic groups. It should be noted that these terms are often used loosely. Cofactors can be divided into two broad groups: organic cofactors, such as iron-sulfur clusters. Organic cofactors are often vitamins or are made from vitamins. Many contain the nucleotide adenosine monophosphate (AMP) as part of their structures, such as ATP, coenzyme A, FAD, and NAD+. This common structure may reflect a common evolutionary origin as part of ribozymes in an ancient RNA world. It has been suggested that the AMP part of the molecule can be considered a kind of "handle" by which the enzyme can "grasp" the coenzyme to switch it between different catalytic centers. Some enzymes or enzyme complexes require several cofactors. For example, the multienzyme complex thiamine pyrophosphate (TPP), covalently bound lipoamide and flavin adenine dinucleotide (FAD), and the cosubstrates nicotinamide adenine dinucleotide (NAD+) and coenzyme A (CoA), and a metal ion (Mg2+).